Kids are curious and enjoy learning new things; they are like a sponge ready to soak up all that you have to teach them. 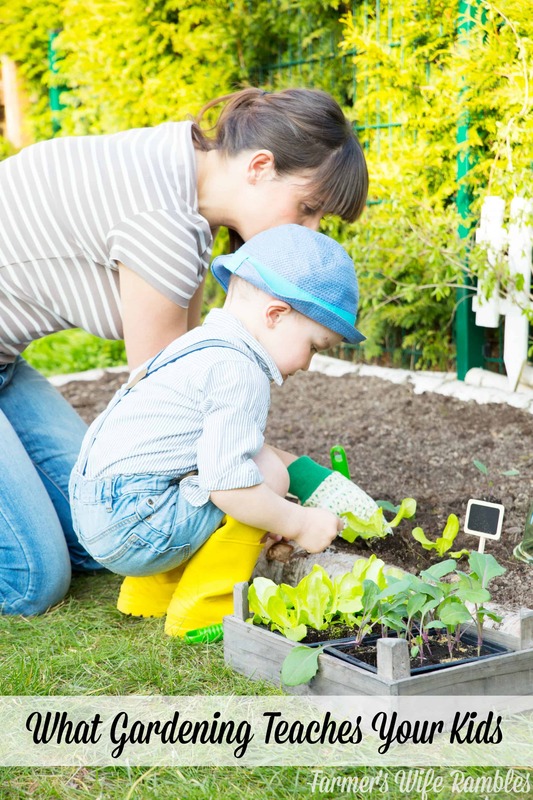 When it comes to gardening with kids though, what your kid learns from this simple family activity far surpasses what you could instill within them with any other activity. Gardening with kids can be done as a family unit when your kid is super young and develop into an independent task as they get older. Starting your child off on the path of growing their own food teaches them science. Where food comes from, how it maintains proper growth and when to pick each item grown are valuable skills that will help your kid survive when they are an adult seeking to feed their family. Going beyond this valuable skill, there are many things gardening teaches kids. Every good gardener knows that you must develop patience when it comes to nurturing, caring for and growing your own food. There are a lot of variables that come into play, such as rodents or insects that can ruin your crop, and lack of appropriate weather may be harsh on your crop. Patience will be taught during this tedious time of gardening. When growing and maintaining a family garden you must work together to ensure the crop grows a large amount of produce. With gardening comes the need to work together as a team to develop the pattern of watering, weeding and tilling the garden. Teamwork is a necessary skill for any human being to be successful. When kids learn to build a family garden they start to learn creativity in ways no other task can teach them. If you have a small yard that has to be used for both garden and play area, your kids can learn to think of ways to use the property most efficiently and this encourages their creative mind to work more. Having your kid read how to properly care for the crop and read articles on maintaining a garden helps encourage them to have a love of reading. Add a daily gardening journal to their to-do list when it comes to the family garden and you are teaching them the skill of reading plus writing alongside tracking progress. Gardening is all about science, it teaches your kids where food comes from, how long it takes to grow the food and the various physical appearances of food in all of the stages of growth. Combine science with math by having your kids measure their crop as it grows and document the data in their garden journal. Gardening is a great life skill to instill within your kids, even without all of the other life lessons listed here as it teaches them to nourish their self without going to the grocery store. When a kid has the love of gardening they will eat healthier and be happier knowing that they are growing food that is chemical free. We are having so much fun with our garden this year. My kids help my husband build the boxes and they have been fascinated with watching the plants grow. It is great! We are starting our garden this weekend! Cannot wait. it is something we really love doing with our kids every summer. Very nice. I have never been good at gardening but I have always liked the idea of having a family garden. Who knows? Maybe they’ll be better than I! I think it is great to teach kids about gardening. How things grow. Where our food comes from. Planting a flower and watching it bloom. Interesting and fun!! My boys (ages 5-11) want to plant some stuff. Cherry tomatoes, jalepenos, serranos (we like spice!). I think we will take the plunge soon. We love gardening with my 3-year-old! He gets REALLY excited when the plants start to pop up, and even more excited when it’s time to pick some of the veggies to eat with dinner. These are all valuable lessons to teach/learn through gardening, especially patience! I enjoy gardening I’m just not good at it. I am hoping to get in a late spring garden soon and see how it goes.